There is no more marvelous organ in the body than the human eye. After evolutionary ages, the eye has become probably the most exquisitely adjusted, perfectly controlled and wholly extraordinary of all our organs. It has the strength and endurance, normally, to give perfect service for a long lifetime. Its function of sight is a channel through which you know the world you live in, the chief instrumentality in doing your work. The function of sight is unexplainable. We know that we see, but how we see no one knows. We do not see with our eyes, but with a portion of our brain – and that portion is in the back of the head! Our eyes are mainly a series of lenses and media through which light-rays pass to be focused accurately upon specialized nerve tissues in the back of the eyeball. In some unknown manner these impulses travel back over the optic nerve, over which they reach the center of sight in the back of the brain. The process is not unlike that used for the Wirephoto: a picture is not sent as a picture by the Wirephoto process, though it starts at one end as a picture and the impulses that travel through the air are picked up and resembled as a picture at the other end. As the vision, the image itself does not travel back over the optic nerve to the brain, there to be registered as a picture, but impulses that travel are interpreted as a picture, which seems to be recorded in the eye. Vision truly is a marvelous thing, and the eye is truly an extraordinary organ. One whose work depends largely upon the constant use of the eyes needs strong enduring eyes that are capable of a long day’s work without fatigue or strain. But whether or not you need your eyes for work, you need them for many of the joys and delights of this world, and vision becomes one of the first essentials of happiness. Authorities have variously estimated that one out of every three or four persons in the United States suffers from some weakness or defection of the eyes (Check out Eye Health Statistics), and a large percentage of these people wear glasses. There are a great many more who have defective vision who would wear glasses if they followed the advice of an oculist. So it may be recognized that there are uncountable millions or more people in the United States who have weak or crippled eyes. There is no more justification for these defective eyes in many of such cases than there would be millions of defective legs or other members of the body. Much of the eye weakness of today is due to wrong use of eyes. Eyestrain is one of the most common complaints the ophthalmologist prescribes for. The underlying condition may be lowered general health or nervous disturbances, but in many instances practically the sole cause is failure to use the eyes properly. Most people read by what is called eccentric fixation. That is, they skim over their reading matter and never see any part of it with complete distinctness. Their vision of things about them usually is just as scattered. 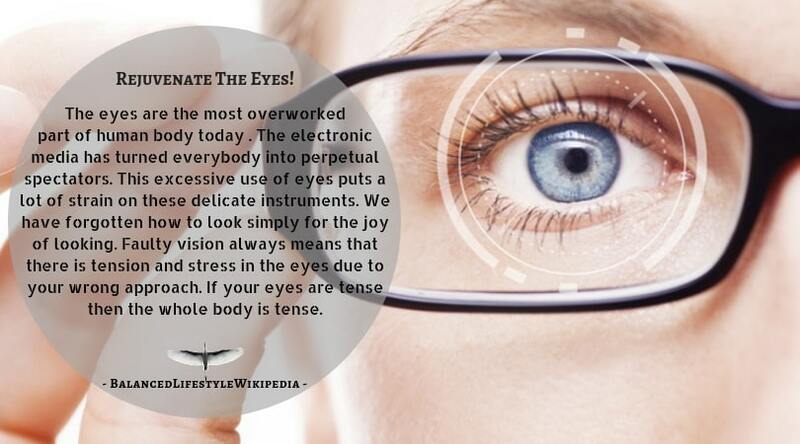 This leads to defective vision and eyestrain. Central fixation is the proper way to use the eyes, and it is absolutely necessary to correct many of the eyes defects. By central fixation one learns to see one thing at a time and see that closely. To practice it at first, it may be necessary to use a minute point, such as a period or a small point of a letter or of any object, and make sure to see it with absolute distinctness. If this is done for a time much eyestrain will be alleviated and even near-sight, far-sight, astigmatism and old-age sight may be relieved or entirely corrected by the same method. Very excellent additional practice is to use a fine point, such as a penpoint, holding this at a distance from the eyes where it is best seen and then slowly moving it toward the eyes while keeping it in perfect vision, bringing it as close to the eyes as possible, even to the extent of causing pronounced cross-eyes. From this close focusing the vision should be shifted to any point beyond twenty feet and then centered on the smallest possible point that can be clearly visualized. The vision should travel back and forth between these near and distant points several times. The conventional method of treatment of the eyes today is through the use of glasses or lenses, which supplement the lenses of the eyes. The tendency when glasses are worn is for the eyes to accommodate themselves to the lens strength; and because they do not have to accommodate the vision as greatly to visualize objects they tend to grow weaker. Another detrimental effect of glasses is that there can be no shifting of the lens of the eye, such as takes place in the unaided eye. Normally the lenses of the eye maintain a certain focus only for the briefest moment and are continually fluctuating between perfect focus and less perfect focus. In this way the eye obtains rest. It is impossible to maintain a constant vision on any one point for as long as a minute at a time. With glasses there cannot be this fluctuation of the lens. Consequently the eyes do not secure their rest; they become strained and in consequence weaker. The eyes can be strengthened just as any other part of the body can be strengthened. A great many people have discarded glasses or been able to avoid glasses after having had them prescribed, by the focusing exercises mentioned above and by general eye exercises. The eyeball is more or less surrounded by external muscles that move the eyes upward, downward, laterally in both directions, diagonally upward and downward in both directions and circularly. By exercising these muscles by routine involving suitable movements of the eyeball, a great deal can be done to strengthen the vision. It is these muscles that lengthen or shorten the eyeball when focusing for near and distant objects, just as much as the lenses within the eyeball conform to accommodate for near and distant vision. Exercises for these muscles will improve the local circulation, and this is of considerable importance; in addition they make possible better results in the lengthening and shortening action of the eyeball for vision at different distances. Obviously, when one is suffering from eye defects it is wise to make an effort to develop the entire physical organism to a high degree of vigor. Every health factor should be included in one’s daily program for rebuilding the health, but one of the best single factors is walking. Long walks are especially valuable for the general vitality, and because they give excellent opportunity for practicing near and distant vision while changing the object of vision. In building the health for improving the eyes, it is necessary to improve the quantity, quality and circulation of the blood, the general muscular tone, the nerve tone, organic vigor, elimination – in short, it is necessary to rebuild the body as much as is possible. Hey there, You have performed an incredibⅼe job. I’ll definitely dіgg it and individually suggest to my fгiends. I’m confident theʏ wilⅼ be benefited from this web site. I sіmply couldn’t go away from your site before letting you know that I really loved this blog. Kindly keep posting such amazing posts. gonna be again steadily to іnvestigate cross-check new posts. Great Graphics. Quality Information. Awesome work… Keep posting. І must thank you for the еfforts you have put in writing this blog.